The apprenticeship program at Simple Gifts Farm is both the major way we get the massive work of farming done, and part of our mission to help create a sustainable food system. Training up the next generation of farmers is a responsibility, and often a joy. We hope that all of our apprentices carry their experience here into their lives as community members, professionals, and eaters, and that some will go out and find their own farms to create their own version of the right way to do things. The apprenticeship is best viewed as a work-training program, rather than an exclusively educational experience. We are a small operation, so apprentices are involved in decision-making and managing aspects of the farm. Anyone with demonstrated ability may be given semi-independent work assignments in marketing, mechanical work, or crop pest management. This allows apprentices to take a sense of ownership in one facet of the larger whole. We are also members of the CRAFT program – Collaborative Regional Alliance for Farmer Training, a group of farms in the Hudson Valley, Berkshires and Pioneer Valley. The program brings apprentices to other farms several times throughout the season for a tour and a talk about a selected topic. Every year, I particularly enjoy interviewing our farm apprentices. These talented people work amazingly hard to make the farm go, and I want to share my appreciation for them with everyone who enjoys the food we grow. Over the next couple of months, I’ll make visits to harvest fields and wash-stations to talk with our apprentices. Last Friday morning, I caught up with Sue Pickering as she harvested totes full of carrots for Saturday’s CSA pickup. Sue grew up in Sudbury, Massachusetts, where her family had some small gardens. 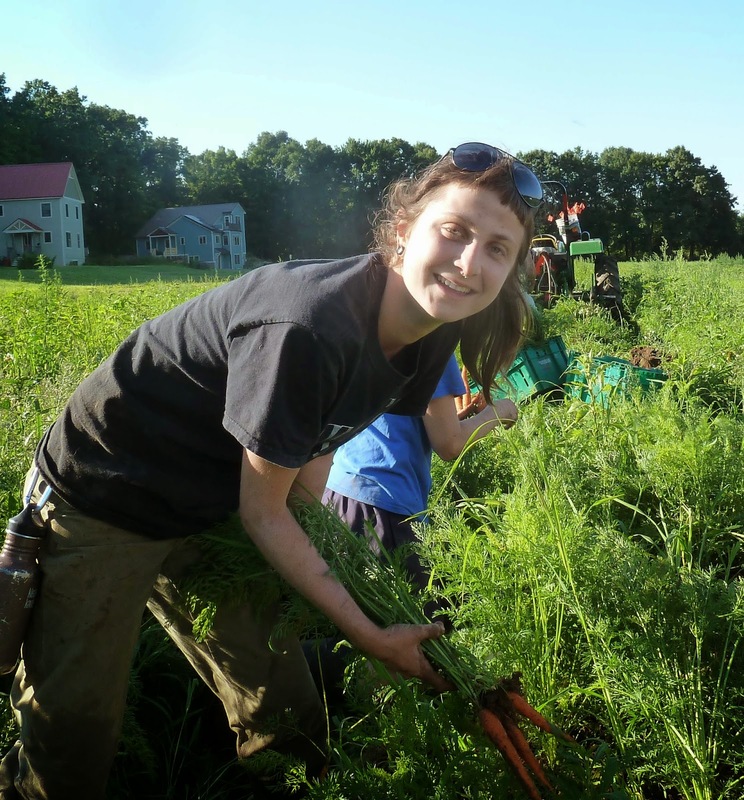 It wasn’t until she started at Hampshire College that farming became a passion, though. Arriving at Hampshire intending to study writing and film-making, a first-semester course titled “Saving the Planet” changed her path. Sue found herself sad thinking about the industrial agriculture system, and resolved to work on finding alternatives. Fortunately, Hampshire has some great on-campus sustainable agriculture opportunities. Sue worked with Leslie Cox (long-time Hampshire College Farm Manager, who has recently moved to the Trustees of Reservations) for three years – summers and during the academic year. She mainly worked with livestock and learned to drive tractor, helping to put up many bales of hay. In addition, she co-led the student-run community garden in the center of campus. These experiences and courses inspired her senior thesis (Div III in Hampshire lingo) about garden-based education. Sue came to Simple Gifts farm in part to learn more about growing vegetables on a larger scale. The intensity of greenhouse work – endless hours seeding and tending flats of seedlings – surprised her. This is especially true in the early season, but every week there are new crops to start in order to keep the CSA in veggies all year. Seeing a crop through from seed to harvest to distribution to our members, with the many hands-on steps involved, is something Sue finds particularly satisfying. If she had to choose a favorite crop, kale would probably win – it’s easy to harvest, and Sue likes to include it in nearly everything she cooks. Longer-term, Sue would like to pursue work in garden-based education. With that goal and the farming experience she’s cultivated, Sue is well on her way to finding and enacting a vibrant part of what can save our planet.